Instead of staying stuck and frustrated, have fun and move your business forward with the Right-Brain Business Plan® approach. At my place or yours! Do you hate the idea of writing a business plan but know you need one? Do numbers numb you out? Do words like business plan, cash flow, and balance sheet make your skin crawl? Do you have a big vision for your business but struggle with seeing it through? Do you prefer colors, images, and feelings to spreadsheets, tables, and templates? Do you want to make a positive impact with your business but avoid the business aspects of your job? Do you feel that planning is boring or daunting, or that it gets in the way of the “real work”? Are you turned off by the formality and nitty-gritty detail of traditional business plans? Do you believe there’s got to be a better way to run your business? Craft your Business Vision and Values so you know where your business is headed. Paint your Business Landscape so you know where you and your biz fit into this big world. Find and connect with your perfect peeps for the most effective marketing. Take inspired action to get results with ease. Contact me to attend or schedule a workshop! This workshop and program created by Jennifer Lee, author of the bestselling book The Right-Brain Business Plan®, will teach you a visual, creative, and accessible process to clarify your business vision, goals, and actions steps in a way that’s creative, inspiring, engaging, and expressive (just like YOU!). 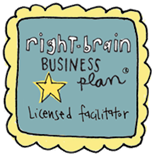 So instead of staying stuck and frustrated, how about having fun and moving your business forward with the Right-Brain Business Plan® workshop.